Our treatment philosophy is based on a teamwork approach to providing long term treatment to our patients and their families to achieve their best oral health. We provide a full range of dental services in a friendly, caring environment. • Digital imaging incorporates computer technology in the capture, display, enhancement, & storage of digital images. • Uses 90% less radiation than regular x-ray film. • Allows for much clearer and better diagnostics. • Educates patients because they can see and understand their dental problems at the time of their x-rays. • Results are instant allowing for less waiting time for patients. and base of the skull. • Useful in certain situations for diagnosing tooth problems. At Dentistry on Bellevue we perform regular screenings for oral cancer. Over 42,000 new cases of oral cancer are diagnosed each year in the United States and 3,200 cases were diagnosed in Canada in 2007. People 60 years and over are most at risk, but the number of cases is increasing in those under 40. Youth is no longer a protection, especially with the popularity of tanning salons and the use of smokeless tobacco. If oral cancer is found early before it spreads to the lymph nodes or other areas, the cure rate is 90%. At Dentistry on Bellevue we believe that we are the front-line experts in finding oral cancer. Routine, careful examination of dental patients is appropriate and necessary. This can easily be achieved during a regular dental visit. Even upon general review of the patient’s social and medical history, possible correlative factors can be identified. In addition to a comprehensive physical exam, we use VELSCOPE, which is a revolutionary hand-held device that offers dentists and hygienists an easy-to-use adjunctive screening instrument for early detection of soft tissue abnormalities. Its technology platform is based on the direct visualization of tissue fluorescence and the changes in fluorescence that result when abnormal tissue is present. This change is detected by the operator viewing the tissues through a special scope. These changes are not evident under incandescent light. Developed in British Columbia by scientists from the BC Cancer Agency and the UBC School of Dentistry, the Velscope is now recognised world wide as a major advance in the detection of oral cancer. VELSCOPE provides a more effective oral cancer screening protocol with immediate benefits for the patient and the clinician. Sleep apnea makes it impossible to get the restful, restorative sleep your body and mind need. Sleep apnea treatment at Dentistry on Bellevue can alleviate these episodes. Dr. Moisseev will work collaboratively to develop the treatment plan that will be most effective for condition, helping restore the quality sleep you need to function at your highest level. Sleep apnea is a sleep disorder in which you stop breathing several times throughout the night. Each episode may last from just a few seconds to as many as 30 or longer and is often accompanied by choking or gasping sounds when breathing resumes. Sleep apnea occurs because the airway is not open all of the way. Oftentimes the airway blockage is caused when the muscles of the throat relax, causing a partial or complete obstruction. This is called obstructive sleep apnea (OSA). OSA is sometimes treatable through noninvasive dental treatments available at our office. Central sleep apnea, which is related to interrupted signals between the brain and the muscles of breathing, is not treatable through dentistry and will require the assistance of a physician or somnologist. If you have been diagnosed with OSA and are looking for an option that does not involve machines, tubing, and masks, Dr. Moisseev may be able to help. Give us a call today to schedule your consultation and learn more. How white teeth appear is affected by the colour of the underlying dentin and the thin outer coating of enamel. Dentin hue is determined by genetics, early childhood medications, age, and trauma to the teeth which can all cause darkening. Also, enamel varies in shade and translucency.Toothpaste and mouthwash are most important in maintaining the health of your teeth, but neither will whiten your smile, because they are too transient and would irritate the soft tissues in your mouth if they contained the chemicals required to whiten your teeth. What is Zoom!™ tooth whitening? Zoom! is an in-office tooth whitening process that lightens tooth discoloration. It is safe, highly effective, fast and great for patients looking to get immediate pronounced results. Your teeth may be whitened by up to ten shades in only one office visit. How long do the results last? Teeth tend to get darker over time. Your initial bleach should be good for about 18 months. We can also provide a Zoom! take-home touch-up kit with custom-fitted trays. Most often a touch-up once a year will maintain your sparkling smile. What is Spa Dent Tooth whitening? Spa Dent incorporates the latest LED technologies and gel formulations to remove stains. The light accelerates the hydroxyl radicals penetrating the tooth enamel to eliminate stains. Spa Dent whitening gel is PH neutral, has no silica and contains xylitol to help neutralize harmful bacteria. Problems with tooth enamel are typically associated with acidic products and abrasives. As a result, 98% of people experience no sensitivi†y after the treatment. Spa Dent gel will not harm crowns, bridges and veneers and will remove the stains that have accumulated over time returning them to their original colour. At Dentistry on Bellevue we have a special interest in cosmetic dentistry. Providing both high end Cosmetic Dentistry & simple inexpensive “tweaks” to smiles throughout the West Vancouver area & surrounding communities. Cosmetic dentistry spans a number of dental fields. Improving your smile can vary in complexity from simple filling replacements with tooth-colour matched composite resin to full smile makeovers using Dental Crowns, Porcelain veneers, dental implants & even dentures. Dr. Moisseev & his team believe that Cosmetic Dentistry outcomes are all about creating beautiful, natural looking smiles. Enhancing your smile naturally. with our help without it looking like you have a mouth full of dentistry is what we believe this is all about – ie creating a beautiful natural smile that doesn’t look like great dentistry, just great teeth. This can be achieved in many different ways. Whether it’s unsightly fillings, old amalgams, crooked teeth, gaps, decayed, lost, broken, discoloured or stained teeth we can help you. Make a start & find out what your options are by booking a cosmetic consultations with us today. Anyone can lose one or more teeth from a fall, car accident or due to a large decay. Teeth with large fillings are weakened and more likely to break. When missing teeth are not replaced, the remaining teeth can shift or rotate, changing appearance of the smile and making chewing painful and difficult. Historically, teeth have been replaced with removable dentures or fixed bridges. Over the last decade, dental implants have become an increasingly more reliable and predictable option, both as a result of advances in surgical techniques and improved bio-materials. Dental implants are usually made of titanium and are surgically placed into the jawbone, literally replacing the root of the missing tooth. 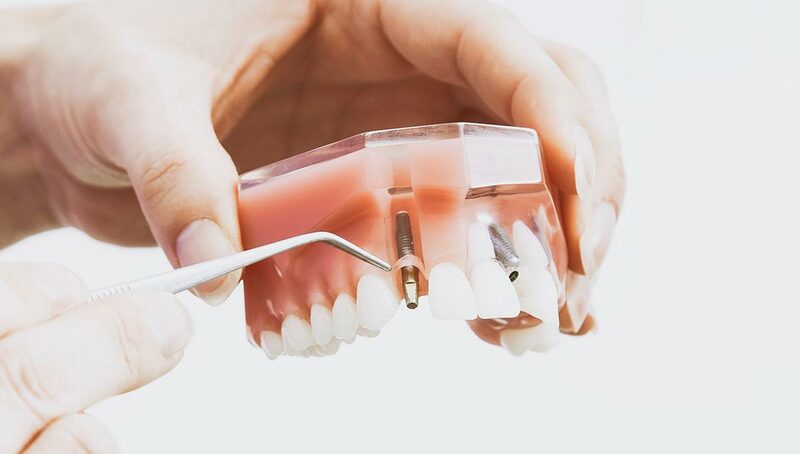 Following a variable healing period, replacement teeth in the form of crowns or dentures will be attached. Implants have proven to be extremely safe, reliable and cost effective in replacing missing teeth. Their success rate makes dental implants one of the more predictable and ideal means of restoring normal use of one’s teeth, and especially, the beauty and confidence of one’s smile. However, because this is a surgical procedure, there is a small risk of problems which can result from any surgically-invasive procedure. These include, but may not be limited to, infection, pain, and other unforeseen complications from the surgery. Dental Implants generally require a greater financial commitment than a fixed or removable denture. The cost can vary due to the very personal anatomy of each patient and his or her requirements, and will include the surgical placement of the implants, the fees for all the implant components and the final crown/s or denture and its placement. Custom-made Sportsguards, fabricated and fitted here by our dentists, represent the highest standard of recreational Sportsguards available. They fulfill all four criteria for accurate fit, retention, comfort and resilience. The stability of the material provides for durable wear over several years, even with daily use, and they interfere least with speaking. Athletes find their breathing is not adversely affected, even during hard play, and they are comfortable to wear for the length of the game. Accurate fit means every tooth and all gum surfaces of the upper jaw are covered and protected. This is not a one-size-fits-all approach! Retention means the Sportsguard stays in place, instead of being chewed or dislodged by the player. A loose Sportsguard offers no protection for the athlete! Comfort is mandatory, because no one will wear a Sportsguard which irritates the gums or hurts the teeth. Resilience is important in providing dependability and long wear, depending on the age of the athlete and the care they provide to keep their Sportsguard clean and safe. 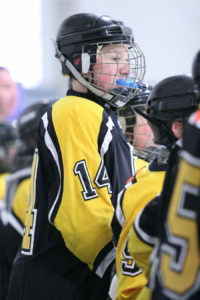 A professionally-fabricated Sportsguard is as much a part of an athlete’s uniform, as any other equipment required of the player. Just as cleats will last as long as the wear-and-tear of play and feet size allow, a well-fitted Sportsguard will last as long as the player’s oral anatomy remains the same, to be replaced only after normal wear over a 2 – 3 seasons. 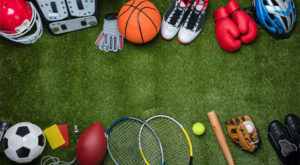 This is the only type of Sportsguard any athlete of any ability should wear, especially when compared to the price of restoring fractured or lost teeth due to using an ill-fitting mouthguard. Call our West Vancouver dentists today to find out more! Custom-made Sportsguards, fabricated and fitted here by our dentists, represent the highest standard of recreational Sportsguards available. They fulfill all four criteria for accurate fit, retention, comfort and resilience. The stability of the material provides for durable wear over several years, even with daily use, and they interfere least with speaking. Athletes find their breathing is not adversely affected, even during hard play, and they are comfortable to wear for the length of the game. Call our West Vancouver dentists today to find out more! 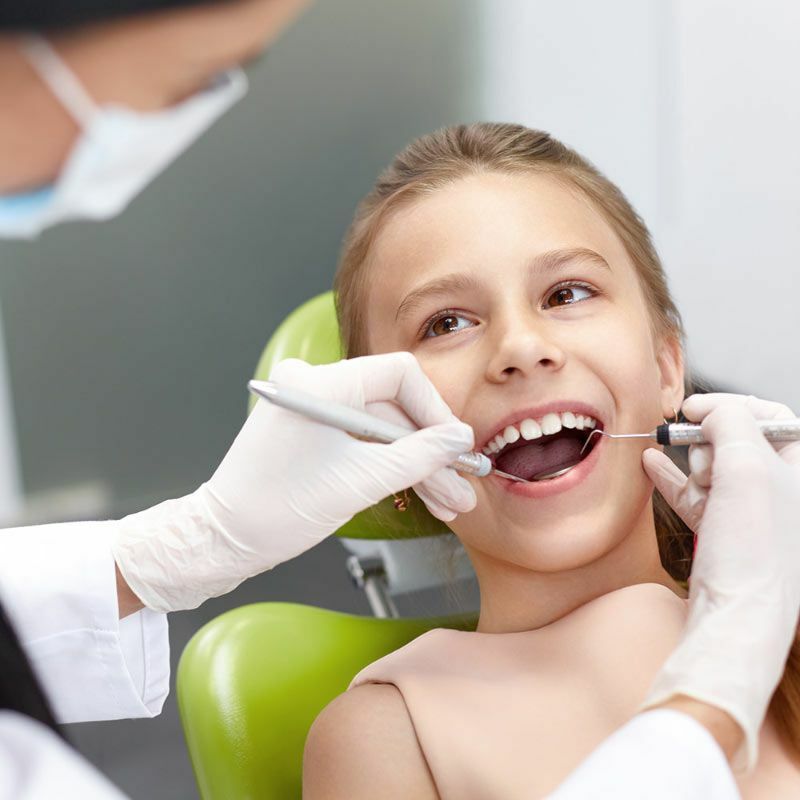 At Dentistry on Bellevue, located in West Vancouver, you can feel confident that our team will work diligently to ensure your child has a pleasant and positive experience at each and every visit. We create a safe, comfortable dental home to help your child on the path of a healthy, beautiful smile. We provide diagnostic, preventive, and restorative dental care for your child using today’s most advanced dental technology, equipment, and materials. 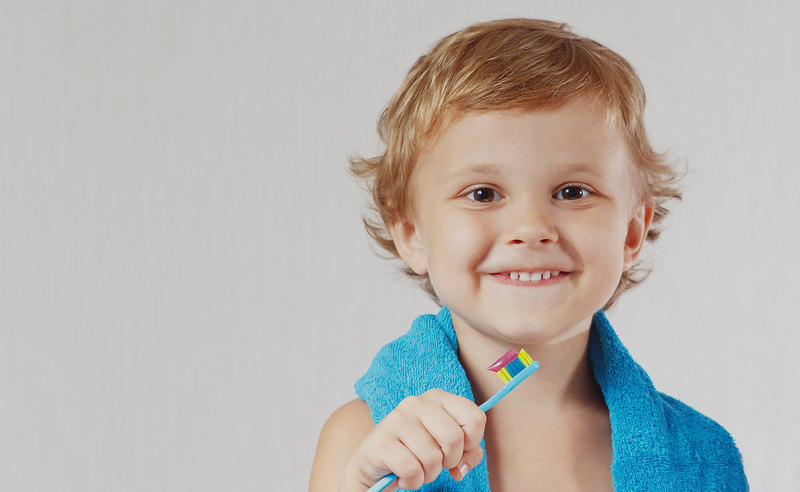 We focus on not only improving your child’s oral and dental health, but their entire well-being. Prior to treatment, we will take the time to discuss your child’s emotional needs and challenges to ensure we provide the best care. At Dentistry on Bellevue we believe in exceptional Dental Care!